Idina Kim Menzel (/ɪˈdiːnə mɛnˈzɛl/; born Idina Kim Mentzel; May 30, 1971) is an American actress, singer, and songwriter. Additionally, Menzel is known for portraying the role of Shelby Corcoran on the musical dramedy TV series Glee from 2010 to 2013 as well as portraying Nancy Tremaine in the 2007 Disney film Enchanted and being the voice of Queen Elsa in Walt Disney Animation Studios' 2013 film Frozen, in which she sang the Oscar and Grammy Award-winning song "Let It Go". The song reached number 5 on the Billboard Hot 100 chart, making Menzel the first Tony Award-winning actress to reach the top 10. She ultimately won a Grammy award for the film's soundtrack. Her album Holiday Wishes was released in 2014 and reached number 6 on the Billboard 200 album chart, making it her highest charting album to date. Idina Kim Mentzel was born on May 30, 1971. Her birthplace is varyingly reported as either Queens or Syosset. She grew up in Syosset, the daughter of Helene, a therapist, and Stuart Mentzel, a pajama salesman. She has a younger sister named Cara. Menzel's family is Jewish, and her grandparents emigrated from Eastern Europe. Menzel attended Syosset High School. Following Wicked, Menzel appeared off-Broadway in the Public Theater's production of See What I Wanna See, a Michael John LaChiusa-penned musical whose run ended in December 2005, for which she received Drama Desk Award and Drama League Award nominations. She reprised her Tony Award-winning role as Elphaba in the West End production of Wicked when it opened at London's Apollo Victoria Theatre on September 7, 2006. During her run, she was the highest paid female performer in the West End at $30,000 per week. Menzel finished her West End run on December 30, 2006. She was succeeded by Elphaba standby Kerry Ellis. Menzel played the role of Florence in the 21st-anniversary concert of Chess at the Royal Albert Hall, London from May 12 to 13, 2008, alongside Kerry Ellis, Adam Pascal, and Josh Groban. On February 28, 2013, it was announced that Menzel would make her return to the Broadway stage, starring as Elizabeth in the new Tom Kitt and Brian Yorkey musical If/Then. The new musical, directed by Michael Greif (whom Menzel previously worked within the original production of Rent), had its world premiere at the National Theatre in Washington, D.C., starting with previews on November 5, 2013, till November 24, 2013. Following the out-of-town tryout, the show moved to the Richard Rodgers Theatre on Broadway and began previews on March 4, 2014. It officially opened on March 30, 2014. For her performance, Menzel was nominated for her second Tony Award for Best Leading Actress in a Musical, losing to Jessie Mueller for Beautiful: The Carole King Musical. If/Then closed on Broadway on March 22, 2015, after 29 previews and 401 regular performances. Menzel reprised the role of Elizabeth (along with original Broadway cast members Lachanze, James Snyder, and Anthony Rapp) on the first seven stops of the National Tour of If/Then from October 2015-January 2016. She departed the show (along with LaChanze and Snyder) on the last day in Costa Mesa, California, on January 24, 2016. Her replacement was Jackie Burns (who previously served as Menzel's standby in the Broadway production) starting January 27, 2016, in Dallas, Texas. Her second album, Here, was released independently by Zel Records in 2004. Menzel contributed to the soundtrack of Desperate Housewives in 2005. She also appears on Ray Charles's album Genius and Friends, which was also released in 2005, on the track "I Will Be There." In 2007, she appeared on the Beowulf soundtrack singing the end credits song, "A Hero Comes Home." Also, in 2007, Menzel's powerful singing voice led her to be asked to accompany the baritone British X Factor runner-up Rhydian Roberts on his debut album, duetting on the song "What If". In April 2010, Menzel returned to concert stage embarking on her "Barefoot at the Symphony Tour" in which she was accompanied by major symphony orchestras. Her performances included collaborations with the New York Philharmonic, the Boston Pops Orchestra, and the North Carolina Symphony, and featured symphonic arrangements by New York composer and producer Rob Mounsey. In October 2011, Menzel returned to London to perform a one-night-only concert in the United Kingdom at the Royal Albert Hall with the Royal Philharmonic Orchestra with Marvin Hamlisch conducting. Menzel's concert stop in Toronto was filmed at The Royal Conservatory of Music on November 17 and 18, 2011, for her second PBS special. She was accompanied by the Kitchener-Waterloo Symphony with Marvin Hamlisch conducting and special guest Taye Diggs, Menzel's husband. Idina Menzel Live: Barefoot at the Symphony was released as a live CD and DVD and aired on PBS in March 2012, with Musical Director Rob Mounsey producing. BWW. "Idina Menzel Live: Barefoot at the Symphony to Premiere on Chicago's PBS January 9; March 3 Nationwide". BroadwayWorld.com. Retrieved February 4, 2015. After minor roles in Kissing Jessica Stein and Just a Kiss, Menzel had supporting roles in The Tollbooth and Water in 2004. Her first major role in a major film was in 2005 when she reprised her role of Maureen Johnson in the film adaptation of Rent. She was nominated for several critics circle awards for the part. In 2007, she played Nancy Tremaine in the film Enchanted. In 2013, Menzel starred as Elsa in the animated film Frozen. Menzel's performance received praise from film critics. The film became the highest grossing animated film of all time, and one of the highest grossing films of all time. Menzel gained particular notice for her song Let It Go, which won an Academy Award and a Grammy Award and was nominated for a Golden Globe Award. Menzel herself won a Grammy Award for the film's soundtrack. She is also featured in the song "For the First Time in Forever" and its reprise. She has since reprised her role of Elsa in multiple video games and the 2015 short film Frozen Fever, and will reprise it again for Frozen 2. Menzel stars as C.C. in the Lifetime TV movie remake of the film Beaches, scheduled for broadcast on January 21, 2017. She is also set to star on the Ellen DeGeneres-produced sitcom Happy Time. Describing Menzel as a singer with a "husky voice, which sometimes veers toward shrieking until she effortlessly reins herself in or, amazingly, kicks it up another notch," Melissa Ruggieri of The Atlanta Journal-Constitution concluded that she possesses "a superior instrument" both in studio and live. On her own vocal technique, Menzel revealed that she prefers to avoid moving her shoulders while singing, telling The Philippine Star, "I actually try to take a smaller breath for a bigger, longer note because there's less air that will come pummeling out." Professionally trained as a classical singer from age eight, Menzel decided to pursue other genres, specifically R&B and jazz when she entered high school. Upon becoming a wedding singer, Menzel was eventually exposed to a wide variety of genres, ranging from jazz and rock to Motown. Menzel married actor Taye Diggs on January 11, 2003. They met in 1995 during the original production of Rent, in which Diggs portrayed the role of Benjamin Coffin III, the landlord. On September 2, 2009, she gave birth to their son, Walker Nathaniel Diggs. In late 2013, it was reported that Menzel and Diggs had separated after ten years of marriage. Their divorce was finalized on December 3, 2014. Her cousin is film critic Scott Menzel. Menzel began dating actor Aaron Lohr and they appeared together in April 2015 at the White House Correspondents' Association Dinner. In August 2015, Menzel and Lohr bought a home located in Encino, Los Angeles, California. They both starred in the 2005 film adaptation of the Tony and Pulitzer Prize winning Broadway musical Rent as well as the Off-Broadway musical See What I Wanna See. On September 23, 2016, Menzel announced that she is engaged to Lohr, via her Twitter account. Menzel was an honorary chair of the Imperial Court of New York's Annual Charity Coronation Ball, Night of A Thousand Gowns on March 21, 2009. Other honorary chairs for the evening's charity event included Elton John, Patti LuPone, John Cameron Mitchell, Joan Rivers, and Robin Strasser. In 2010, Menzel founded the A BroaderWay Foundation with then-husband Taye Diggs as a means of supporting young people in the arts. A BroaderWay sponsors camp programs, theater workshops, innovative educational programming and offers scholarships and opportunities to experience professional performances. In Summer 2011, Camp BroaderWay welcomed young girls from under-served metro New York communities to a 10-day performing arts camp, run by Menzel and a team of acclaimed professional Broadway artists including Taye Diggs. During this camp, the girls collaborated with Broadway artists to write an original musical that was performed at a theatre in New York. The camp was held at Belvoir Terrace Summer Camp in Lenox, Massachusetts. In April 2014, Menzel presented at Broadway Cares/Equity Fights AIDS Easter Bonnet Competition with Bryan Cranston, Fran Drescher, and Denzel Washington, after raising donations at her Broadway show If/Then. ^ a b "Idina Menzel Biography". Biography.com (Fyi/A&E Television Networks). Retrieved June 21, 2014. ^ "Idina Menzel: Streisand, Hamlisch and me". The Jewish Chronicle. October 4, 2012. Retrieved June 29, 2014. ...she is convinced her father — Stuart Mentzel (she changed the surname to make the pronunciation easier) — had singing potential. ^ "'Let It Go' Helps Idina Menzel Make Hot 100 History". Billboard. Retrieved 2016-04-11. ^ Neumaier, Joe (November 15, 2005). "Rent Control. One part original, one part newcomer". Daily News. Retrieved March 17, 2014. ^ Ankeny, Jason. "Artist Biography [Idina Menzel]". Allmusic.com. Retrieved November 14, 2014. ^ Weber, Bruce (October 26, 2003). "The Wicked Young Witches". The New York Times. p. 3. Retrieved November 13, 2014. ^ a b Kachka, Boris (October 23, 2005). "Something Wicked This Way Comes". New York. Retrieved February 18, 2008. ^ Susman, Gary (December 6, 2004). "Witch Hunt". Entertainment Weekly. ^ Lewis, Barry (July 31, 2010). "Broadway sensation Menzel has Catskill roots". Times Herald-Record. ^ Bigus, Ruth Baum (November 3, 2011). "'Wicked' and 'Glee' star flies into Kansas City for benefit". The Kansas City Jewish Chronicle. ^ Boyle, Kelly. "Menzel delivers a Wicked good performance". Boston Music Spotlight. Retrieved November 15, 2013. ^ Ouzounian, Richard (November 29, 2005). "Gig was weddings before Rent called; Menzel's big voice 'discovered' at age 5". The Toronto Star. Retrieved March 6, 2008. ^ "Idina Menzel's Official Website". Retrieved February 18, 2008. ^ McKinley, Jesse (January 10, 2005). "Ding Dong, a Witch Is Hurt, but She Takes Her Final Bow". The New York Times. Retrieved February 18, 2008. ^ "Idina Menzel to Star in London's Wicked". playbill.com. Playbill. April 21, 2006. Archived from the original on April 7, 2014. Retrieved September 7, 2014. 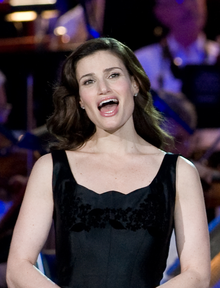 ^ "Idina Menzel highlights casting for Nero". Powerhouse Theatre. Vassar College. June 30, 2008. Retrieved July 26, 2008. ^ . The New York Times. February 28, 2013. ^ Gans, Andrew (November 11, 2008). "Tony Winner Menzel to Perform During Macy's Thanksgiving Day Parade". Playbill. Archived from the original on September 9, 2012. ^ Gans, Andrew (November 27, 2008). "Macy's Parade Features White Christmas, In the Heights, South Pacific, Hair, and Mermaid". Playbill. Archived from the original on September 9, 2012. [...]and Tony winner Idina Menzel will offer "I Stand" on the M&M's on Broadway float. ^ "Nathan Lane, Idina Menzel, Brian d'Arcy James and More to Perform Broadway Celebration at White House". Broadway.com. July 14, 2010. ^ "Idina to Play Ravinia" Archived September 8, 2013, at the Wayback Machine.. Idina Menzel official website. January 5, 2012. ^ Gans, Andrew (February 28, 2012). "Idina Menzel Will Launch New Concert Tour In June; Itinerary, Including Carnegie Hall, Announced". Archived from the original on March 5, 2014. ^ "Happy Early Holidays! Idina Menzel's HOLIDAY WISHES Album Will Get October 14 Release". BroadwayWorld. Broadway World. September 4, 2014. Retrieved September 4, 2014. ^ "Chart Watch: Idina Menzel & Other Jewish Artists Celebrate Christmas". yahoo.com. October 20, 2014. ^ "'Frozen' Superstar Idina Menzel Announces 2015 World Tour". Yahoo Music. November 24, 2014. ^ "Ariana Grande & Idina Menzel to Receive Honors at 2014 Billboard Women in Music Awards". Billboard. ^ "Idina Menzel to sing National Anthem at Super Bowl". NFL.com. NFL. Retrieved January 16, 2015. ^ Robinson, Will; Clark, Noelene (August 5, 2016). "Idina Menzel announces self-titled album, performs new song live". Entertainment Weekly. United States: Time Inc. Archived from the original on August 6, 2016. Retrieved August 5, 2016. ^ Wicked's Idina Menzel Would 'Love' to Guest Star on Glee". People. December 3, 2009. ^ "Glee's Lea Michele and On-Screen Mother Idina Menzel Sing 'Somewhere'". Running Lip. Mersion Media. Retrieved September 26, 2011. ^ Breznican, Anthony (June 11, 2012). "Disney's 'Frozen': Kristen Bell and Idina Menzel to voice animated tale". Entertainment Weekly. ^ Sneitker, Marc (November 30, 2013). "Disney's 'Frozen' soundtrack: Ranking all nine original songs". Entertainment Weekly. Retrieved December 10, 2013. ^ Das, Lina (November 30, 2013). "Idina Menzel: A snow queen to melt our hearts". Daily Mail. Retrieved December 12, 2013. ^ Barnard, Linda (November 27, 2013). "Frozen will warm your heart: review". The Star. Retrieved December 14, 2013. ^ DeTruck, Matt (November 27, 2013). "CD Review: Disney's "Frozen" Soundtrack". City Newspaper. Retrieved December 10, 2013. ^ Asl, Nasim (December 13, 2013). "Frozen Melts Viewers' Hearts". The Oxford Student. Retrieved December 15, 2013. ^ Malkin, Marc (March 4, 2014). "Idina Menzel Hugged John Travolta After Her Oscars Performance, "Laughed Off" Adele Dazeem Mishap". E!. NBC Universal. Retrieved March 6, 2014. ^ a b Newman, Jason (March 5, 2014). "John Travolta Apologizes to 'Frozen' Star Idina Menzel for Oscar Flub". Rolling Stone. Wenner Media. Retrieved March 6, 2014. ^ Eggertsen, Chris (March 4, 2014). "God Exists: Idina Menzel renamed 'Adele Dazeem' in official Playbill for 'If/Then'". HitFix. Retrieved March 6, 2014. ^ Ryan, Patrick (February 23, 2015). "Idina Menzel gets sweet revenge on John Travolta for Adele Dazeem flub". USA Today. Retrieved February 24, 2015. ^ a b Eberson, Sharon (August 26, 2015). "Concert review: Idina Menzel nice, naughty, always entertaining at Benedum". Pittsburgh Post-Gazette. Publishing Co., Inc. Retrieved October 20, 2015. ^ Sheppard, Bettina. "Mezzo-Soprano". Netplaces. About.com. Retrieved August 17, 2014. ^ Holden, Stephen (June 17, 2014). "Big Voice, Defying Gravity". The New York Times. The New York Times Company. Retrieved August 17, 2014. ^ Ruggieri, Melissa (September 10, 2015). "Concert review: Idina Menzel captivates at Atlanta show". The Atlanta Journal-Constitution. Retrieved October 20, 2015. ^ Asis Lo, Raymond de (December 1, 2013). "Idina Menzel is a diva in her own right". Philstar.com. Philstar. Retrieved August 17, 2014. ^ "Idina Menzel". TV.com. CBS Interactive Inc. Retrieved August 17, 2014. ^ "Hitched: Idina Menzel and Taye Diggs". Variety. January 30, 2003. Retrieved August 31, 2008. ^ Michaud, Sarah. "Taye Diggs and Idina Menzel Welcome a Son". People. September 3, 2009. ^ Nudd, Tim (December 11, 2013). "Taye Diggs & Idina Menzel Split". People. Retrieved December 11, 2013. ^ "Idina Menzel and Taye Diggs finally finalise their divorce - Daily Mail Online". Mail Online. ^ "Idina Menzel ditches brunette hair for blonde makeover". Retrieved 2015-09-07. ^ Trulia. "Inside Idina Menzel and Aaron Lohr's Encino Mansion". Retrieved 2015-09-07. ^ Thompson, Anne L. (December 18, 2014). "Frozen's Idina Menzel is a feminist, too". MSNBC. Retrieved May 29, 2015. ^ "23rd Annual Night of A Thousand Gowns". The Imperial Court of New York. Retrieved March 1, 2009. ^ "Idina Menzel – No Day But Today (Pace Academy Benefit in Atlanta, GA 5/17/09) video". NME. ^ "A BroaderWay: About". Archived from the original on April 18, 2011. ^ "Married Broadway Vets Idina Menzel and Taye Diggs 'Call the Whole Thing Off'". Broadway.com. December 7, 2010. ^ "Idina Menzel, Elton John and More 'Give a Damn' Against Hate Crimes". Broadway.com. October 5, 2010. ^ "Idina Menzel Joins NOH8 Campaign's Gay Rights Protest". On Top Magazine. March 21, 2012. ^ "PHOTOS: James Franco, Idina Menzel, and Fran Drescher Get Into the Easter Bonnet Competition". Queerty. April 28, 2014. ^ Avalanche Software. Disney Infinity. Scene: Closing credits, 4:52 in, Featuring the Voice Talents of. ^ Avalanche Software. Disney Infinity 2.0: Marvel Super Heroes. Scene: Closing credits, 2:55 in, Featuring the Voice Talents of. ^ Avalanche Software. Disney Infinity 3.0. Scene: Closing credits, 5:29 in, Featuring the Voice Talents of. ^ "Idina Menzel 2015 World Tour North American Schedule". ConcertTourNewsHub.com. March 27, 2015. Retrieved March 27, 2015. ^ "Idina Menzel World Tour". Retrieved March 27, 2015.